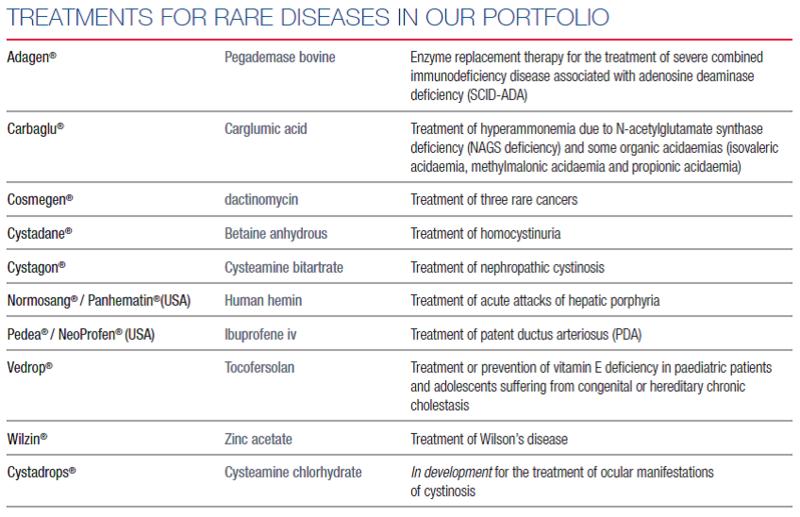 products available to patients suffering from rare diseases was recognized by the National Organization for Rare Disorders (NORD) in the U.S.A. with its 2011 “Corporate Award”. This important award was granted in recognition of the introduction into the United States of Carbaglu®, the first specific treatment approved by the FDA (Food and Drug Administration) for NAGS deficiency, a very rare inherited metabolic disease. The acquisition and diffusion of specific scientific knowledge is fundamental for the identification of a rare disease and is of great importance in the research for new therapies. Recordati is committed to support families suffering from the impact of a rare disease both through the research and development of new treatments as well as through the diffusion of knowledge within the scientific community. Working in the field of rare diseases is an important responsibility to patients and healthcare professionals and we put this at the heart of our strategy. The Academy was launched to provide unconditional grants for training in rare disease. High-level courses are created under the authority of a scientific committee. The overall aim is to share experience in the management and outcome of rare disorders where individual experience is by its nature limited. The Academy offers specialists the opportunity to enrich their knowledge, develop new ideas and establish scientific relationships. Four live events are held each year bringing together clinicians and scientists from all over the world to discuss innovations and new diagnostic and management strategies. The Academy also provides online e-learning courses which aim to provide physicians, world-wide, with clinically useful and the most up-to-date information concerning current knowledge and recommendations for care.